WITHOUT an effective judicial system, a country will deteriorate into a state of chaos or repression. This is the opening sentence in the PNG Magistrates manual and PNG since Independence is lucky to have never experienced a deteriorating judicial system. 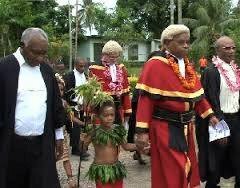 In his various speeches this week during the 2016 Pacific Judicial Conference, Chief Justice Sir Salamo Injia said PNG since Independence has seen a strong independent judicial system founded on principles of individual rights, democracy and the rule of law. Sir Salamo also said with PNG hosting the conference is also indication of the judiciary commitment in maintaining its status quo as uncompromising and fair. Re-iterating the Chief Justice’s sentiments, Prime Minister Peter O’Neill said on Monday this judicial independence is evident with clear separation of powers that has been exercised between the three arms of the government, especially the legislature and the judiciary. The impartiality of the judiciary has been tested time and again with the recent one concerning an order by the highest judicial administration the Supreme Court recalling Parliament to reconvene and entertain a motion of vote of no-confidence in the Prime Minister. The PM also said the National Government recognises the importance of having an effective independent judicial system therefore it is looking at heavily investing in education for strong independent judicial officers.